This moving rack is an optimal choice for storing large volumes on pallets. It is operated by simply pressing buttons. Racks move only while buttons are operated, therefore aisle space is not needed, meaning that warehouse storage capacity increases about 2 to 2.5x compared to stationary pallet racks. The rack is available in a shallow (thin) rail type that can be installed in a short amount of time and a railless type that enables easy layout changes because rails are not installed on the floor. Special specification models with explosion proofing or freeze-resistance are also available for demanding conditions of uses. The rack has a function that send the operational log data automatically. Distribution centers, food product warehouses, cold storage warehouses, hazardous material warehouses, 3PL warehouses, etc. This standard weight rack effectively stores loaded pallets. Each rack can hold 1,000 to 4,000 kg of weight. Proprietary configurations ensure adequate strength for storing heavy loads. Moreover, racks can be easily and quickly assembled on-site owing to standardized parts. Layout and shelf heights can be easily adjusted to accommodate changes in packaging. Antiseismic options such as fall prevention devices and metal meshing are also available to protect both people and stored loads. Uses: Warehouses, factories, distribution centers, do-it-yourself stores, etc. This rack can be loaded with pallets from the front by forklift and then retracted for first-in-last-out storage. The bed runs on slanted rails, therefore loads can be moved without requiring a motor. 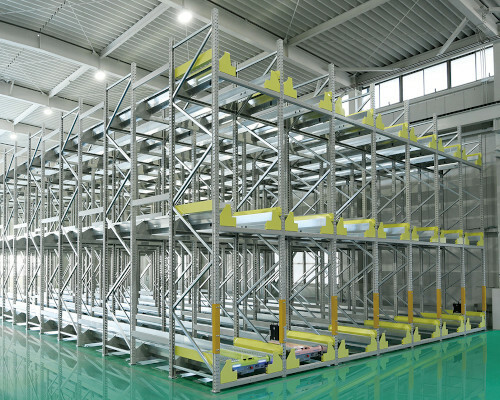 Aisles can be narrower than with stationary pallet racks, thus increasing the storage area to footprint by 1.3 to 2x. And, because no motors are used, there are not any running costs due electricity consumption, etc. There is sufficient enough depth to store up to 6 of the industry’s largest pallets. The bed is flat on top for easy loading and unloading. The bay opening can be fitted with a fall prevention device (option) to protect both people and stored loads in the event of an earthquake. Uses: Storing of food products, seasonal products and parts, emergency supplies warehouses, etc. Shuttle-type horizontally mobile racks reduce both initial costs and running costs, and provide smoother storage and retrieval for large product volumes. A tablet screen is used to direct the shuttle to the appropriate lane for transporting pallets. The original graphic interface makes the touch screen very easy to read, for intuitive operation. Shuttles are switched to the appropriate lanes as needed, so capital investment can be limited to the minimum number of shuttles required for current storage and retrieval operations. The shuttle position, operation status and/or abnormal condition can be confirmed with a single glance at the two-color LED lamp. The buzzer sounds when the shuttle is moving, so the status is clear even when the shuttle is not in view. Almost no electrical work is required, so installation time is short and additional racks can be easily added as storage needs increase. Shuttles can also be added to accommodate busier storage and retrieval schedules, for highly flexible operation. The shuttles can be charged from batteries*, allowing regular operation and business continuity even during a power failure. *Requires shuttle connection to a separate, uninterruptible power supply. The two ends of the shuttle are identical, so every rack is always ready to change to either first-in-first-out, or first-in-last-out operation. Movable racks offer twice the storage efficiency of fixed racks. They are ideal for utilizing the full shelf depth and handling large loads of a limited number of products. This rack uses motor-driven side roller chains to horizontally store loaded pallets. It can be used for either first-in-first-out or first-in-last-out storage as required by layout or operations. The rack can be used in the picking direction, for separated storage by categories, or even temporary storage for production lines. Moreover, storage areas do not need aisles, so storage is more efficient and wall space can be used effectively. A proprietary design minimizes the number of motors, which reduces running costs. Uses: Food product warehouses, pharmaceutical plants, etc. The storage space itself qualifies as an aisle, therefore storage is more efficient than stationary pallet racks. Racks can be designed to meet packaging, weight, height and other requirements. Uses: Warehousing limited number of varieties in large quantities, etc.